If you want to do Christmas shopping differently this time around, here are some few tips you can try to reinvent this yearly tradition and give yourself a break from all the stresses brought about by last-minute shopping. You’d be able to save more money when most stuff is still sold at a cheaper price and you have more options to choose from. In short, you have the option of choosing from a wider variety at a discount. 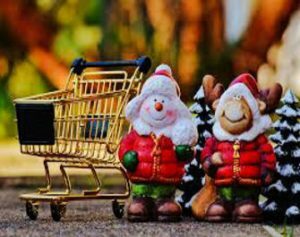 When you shop late, you have no choice but to purchase whatever is sold at shops at a regular price because you need to buy something right away as you do not have the luxury of time since you need to give something, anything, to people, come Christmas day. Make a List – Avoid the temptation to go shopping without a list and look for holiday inspiration. You’ll find inspiration, along with many gift items you didn’t really want at a higher price than you should have paid. Know what you are shopping for and avoid costly holiday “mission creep.” After all, even Santa makes a list (and checks it twice). Make a Budget – A budget is the key to any form of saving. Once you have a gift list, research all the items on that list to find reasonable prices for those items. Once you see the typical range of prices, you’ll know a good deal when you see one. These two are lifesavers in itself, especially in your wallet. As much as you want to share your blessings, don’t also forget that you need to take care of yourself and your family’s needs first before giving to others. Knowing how much you can give to other people and sticking to this budget by making a list is a great way not to go overboard when shopping for Christmas presents. After all, you can always rationalize that it is the thought that counts but still it won’t hurt if you can give a gift because it makes all the difference. Fashion Blogger Lauren Black, pictured here in Jack Wills, tells us: ‘Don’t plan too much and shop by yourself. Everything will be done quicker and without distractions so you’ll avoid conversations like ‘shall I get her this?’ which inevitably will cause your friends to then say ‘no, I wouldn’t get her that….’ and to go off on a rant about why not. Usually my failsafe gift is a beauty product of some sort like a refreshing and deliciously smelling body scrub as they’re small, smell incredible and everyone always needs a scrub! Luxurious toiletries are a no-fail present for both sexes. People will always find it useful no matter what the occasion. There are many other fool-proof holiday gifts that work for both sexes as well aside from these or some other gift staples that people can’t complain about like perfumes, colognes, or functional objects that will always be put to good use all-year round. ‘When in doubt, buy a functional (rather than frivolous) present that someone will actually get some use out of,’ says Digital Editor Delphine Chui. ‘I love buying people bags because they aren’t a pushy or invasive addition to anyone’s wardrobe and I can guarantee they’ll all get some use out of it. Because really, can you ever have too many bags? I’m big into practical fashion, and apparently carrying my whole life with me at all times too, so I’ll likely be bestowing my friends with a velvet number as it’s handy but also festive. I’m loving this backpack from Jack Wills which will have your back (literally) all the way through winter. Since it is also winter, you can’t go wrong by giving a winter-inspired present. A shawl, scarf, boots, coat, jacket, socks, or any cold-weather accessory or clothing is a big hit and will be much appreciated by the recipient. It is a safe gift for both the young and the old that people will eventually like and put to good use. Meanwhile, personalized gifts make the other person feel special knowing that such a gift was specially made for him or her and nobody else owns the same item as them. It is actually a popular idea these days and you can give it as well during birthdays or other special occasions like Valentine’s Day, Mother’s Day etc. If you have the time and the creativity, you can always DIY. Although not many practice this, DIY gifts have a nice touch to them that will not only make the receiver feel good but bring a sense of pride to you who made it.